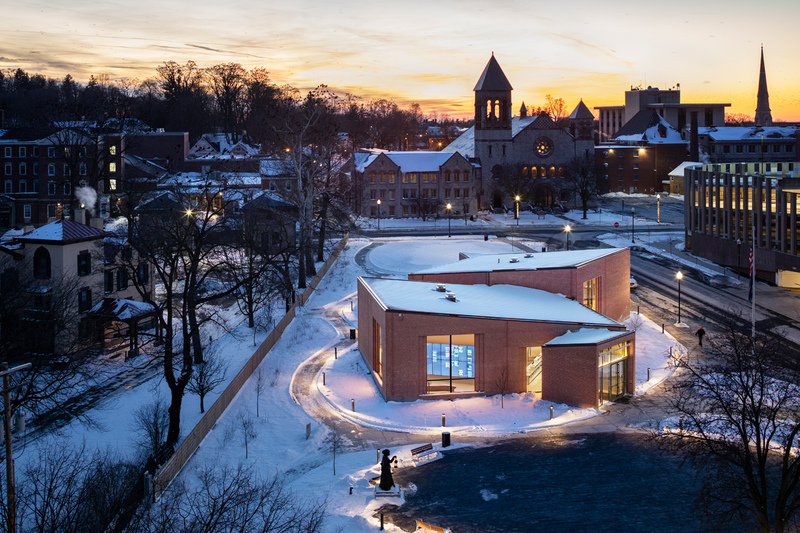 The first new civic building in Auburn, New York, in 40 years lets visitors explore the city’s place in the history of civil rights movements. The nARCHITECTS-designed Equal Rights Heritage Center, now open to the public, frames views of surrounding landmarks to expand the reach of the center to the building's historic context. What began as a request for proposal from the New York State Office of Parks and Recreation and the City of Auburn for a Finger Lakes–region welcome center in 2017 quickly snowballed in importance, according to nARCHITECTS principal Eric Bunge. In light of the rapidly changing national political climate, the governor’s office reoriented the project to focus on New York’s progressive history as a leader in promoting equal rights. The center specifically focuses on women's rights, the abolition of slavery, civil rights, and the more recent efforts for LGBTQ rights. The 7,500-square-foot, $10 million Heritage Center opened to the public on November 13, 2018, in a ribbon-cutting ceremony attended by Lieutenant Governor Kathy Hochul, local officials, and Pauline Copes Johnson, the great-great-grandniece of Harriet Tubman. A statue of the historic abolitionist and activist stands to the south of the new building. The single-story Heritage Center sits smack-dab between several historic landmarks; the building is directly across the street from the Memorial City Hall, is next to the William H. Seward House Museum, and is in the city’s South Street National Register District. A corbelled, pink brick facade was used to better blend the building into the mainly federal-style neighborhood. Inside, the building’s structure was left exposed. Board-formed concrete walls and glulam beams (which appear to continue past the confines of the center thanks to clever mirror placement) were left exposed to open up the interior as much as possible. Radiant geothermal heating emanates up through the terrazzo flooring, eliminating the need for a bulky overhead HVAC system. Double, sometimes triple, height windows frame views of the surrounding city, and the building’s three main interconnected volumes were each rotated to maximize the range of views. Graphic design studio MTWTF worked with nARCHITECTS to co-design the exhibition and wayfinding across the building’s figure-8 circulation path, and the nARCHITECTS-led team pulled double duty as the Heritage Center’s curator. Zones are organized by medium rather than topic, and the center uses posters, videos, recordings, games, a large interactive map, portraits, and other materials to chart the history of equal rights in New York State. But the center will hopefully become the first stop in a broader historical tour of the region for visitors, said Bunge, including the local landmarks visible from the building, and that the “context is content.” Siting the Heritage Center was also an issue for the design team, as the building rose on what was formerly a municipal parking lot. Although there’s a parking garage directly across the street, the community raised concerns over the potential loss of parking at the site. Ultimately, nARCHITECTS chose to exclude any on-site parking to encourage a pedestrian-friendly scheme and included a new public plaza to the center’s east. Construction took only nine months and the project team was able to come in 20 percent under budget. Interested in visiting? Admission is free, and the center is open from 10:00 a.m. through 4:00 p.m. daily. Meet the incubators and accelerators producing the new guard of design and architecture start-ups. This is part of a series profiling incubators and accelerators from our April 2018 Technology issue. The age of the car as we know it appears to be winding down—that is, if the diverse initiatives started by car companies is any indication. 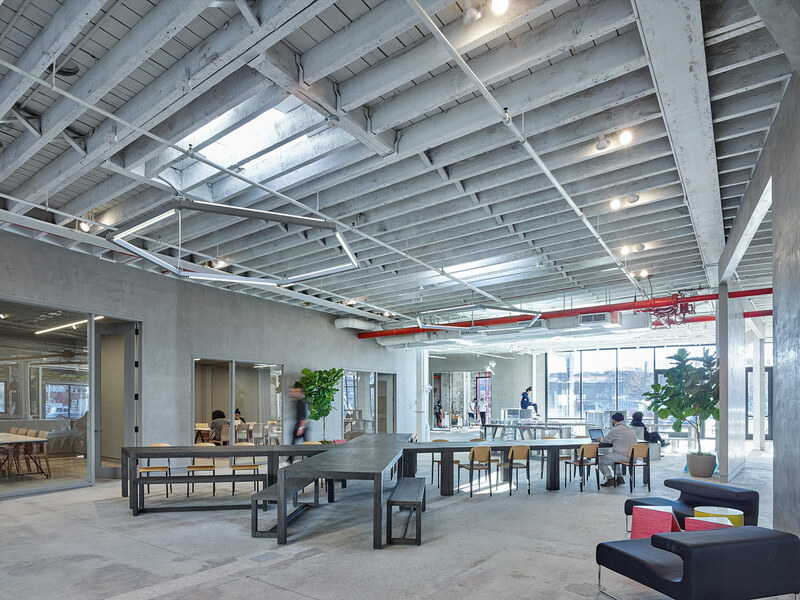 For example, in Greenpoint, Brooklyn, the BMW-owned MINI recently launched A/D/O, a nARCHITECTS-design makerspace and the headquarters of URBAN-X, an accelerator for start-ups seeking to improve urban life. Although URBAN-X is only two years old, the company has hit the ground running thanks to MINI’s partnership with Urban Us, a network of investors focused on funding start-ups that use technology to improve urban living. Through that partnership, URBAN-X is able to use its funding from MINI to take on companies that lack finished products or established customers and then connect them to the Urban Us community. Through a rigorously programmed five-month semester, up to ten start-ups at a time work with in-house engineering, software, marketing, and urbanism experts and given access to the outside funding and political connections that URBAN-X is able to leverage. Competition to join the cohort is fierce, especially since the chosen companies are given $100,000 in initial funding. Architects, planners, urban designers, construction workers, and those with a background in thinking about cities have historically applied. At the time of writing, the third group had just finished its tenure and presented an overview of its work, at A/D/O, at a Demo Day on February 9. The companies have since followed up with whirlwind tours to court investors and realize their ideas. The diversity of projects that have come out of URBAN-X represents the wide-ranging problems that face any modern city. The solutions aren’t entirely infrastructure-based, either. For example, Farmshelf has gained critical acclaim by moving urban farming into sleek, indoor “growing cabinets”; Industrial/Organic is turning decomposing food waste into electricity; and Good Goods has created a platform for smaller retailers to occupy space in large vacancies by pooling money. Ultimately, as cities evolve and become more interconnected, addressing the problems found within them will require ever more complicated and multidisciplinary solutions. The fourth URBAN-X cohort will be announced on May 10, 2018. Notable alumni include: Numina A start-up that uses sensor-integrated streetlights to map traffic patterns. Lunewave A technology company that claims its spherical sensor for self-driving cars is cheaper and more effective than the LiDAR (light detection and ranging) currently in widespread use (likely a win for MINI and BMW). Sencity A platform that encourages human engagement in smart cities. RoadBotics A tool that uses smartphone monitoring to improve road maintenance.0 Qucit This software aggregates urban planning data and uses AI to optimize everything from emergency response times to park planning. nARCHITECTS have designed a new Equal Rights Heritage Center to be built in Auburn, NY. The town is one of the most important places in 19th century American history, as two of the most prominent equal rights crusaders of the era—Harriet Tubman and William Seward—called Auburn home. The museum will house a permanent exhibit and will comprise a 7,500-square-foot building that includes both exhibition and community spaces. It will showcase “the role the State and New Yorkers have played in the struggle for women's rights, abolition, civil rights and the more recent efforts for LGBTQ rights,” according to a statement from the governor's office. The center is located in the South Street National Register Historic District, directly across from city hall and next to the William H. Seward House Museum. Auburn is also home to Harriet Tubman National Historical Park. The design treats the unique location as a part of the exhibition by introducing visitors to their immediate surroundings through large glazed openings and by engaging views of the nearby Seward House Museum, Memorial City Hall, the historic YMCA and Westminster Church, and a new plaza and landscape. These vistas are highlighted through openings along a board-formed concrete perimeter which connects the interior exhibition spaces. The exterior relates to the scale of nearby houses with four one-story volumes of different heights and alternating roof pitches which are punctuated by triangular courtyards. "Sitting at the crossroads of Central New York and the Finger Lakes, Auburn has a played a unique role in New York State history as people and ideas traveled across the state," New York Governor Andrew Cuomo said. "The city was home to great New Yorkers like Harriet Tubman and William Seward who fought for equal rights, and whose homes are now landmarks. 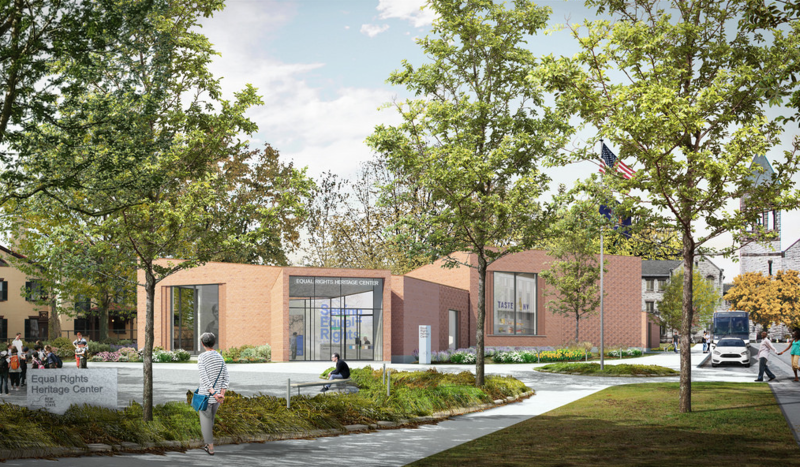 The new Equal Rights Heritage Center will pay tribute to their efforts, and the sacrifices of the many who sought equality, while encouraging travelers to visit all that this region has to offer." The center is funded primarily by a $10 million dollar grant as part of the Central NY Rising initiative, a state initiative to spark economic and community growth in the region. Another $889,000 will be allocated from the Department of State grant through the Local Water Revitalization Program, and $500,000 will be allocated from the Department of Transportation for road construction around the site. "The Equal Rights Heritage Center is another example of the importance that New York State places on educating and recognizing its history and honoring those who served as pioneers before us so that we can become trailblazers for future generations. When we know where we come from we can understand where we need to go," said New York State Office of Parks, Recreation and Historic Preservation Commissioner Rose Harvey. The expected completion time is fall 2018. Cleveland’s downtown is more welcoming thanks to a civic space replacing a formerly traffic-choked intersection. The Public Square is a recently completed 10-acre park designed by James Corner Field Operations (JCFO). The $50-million project also includes a small cafe designed by New York–based nARCHITECTS with local architects Westlake Reed Leskosky. Initiated by nonprofit organization The Group Plan Commission, the Public Square is a major part of larger mission to connect Cleveland’s public spaces to Lake Erie. The design joins four smaller traffic islands situated between the wide lanes of Superior Avenue and Ontario Street in the heart of the city. As part of making the space more pedestrian friendly, Ontario Street was shut down in that section, and Superior Avenue, which still bifurcates the area, was altered and restricted to public transportation. A butterfly-shaped path encircles the site and is flanked by curving park benches designed by JCFO. Within the paths, small hills produce an outdoor amphitheater and provide a lookout over the surrounding traffic. The Café Pavilion, the final piece of the square, includes a large kitchen and a modest interior dining space. A 60-foot glass facade looks out onto the Public Square and a large fountain. A curated art wall covers the opposite facade, while triangulated metal panels wrap much of the rest of the exterior. Side windows, impressed into the form of the building, allow for views from the street through the dining area and onto the square. The only other structure in the square is the 125-foot Soldiers’ & Sailors’ Monument, dedicated to those who fought in the Civil War. Built in 1894, the large monument once occupied one of the quads divided by traffic, but it is now integrated into the corner of the Public Square. By adding a more inviting green space into the center of the city, the designers are taking part in an effort to revitalize Cleveland’s downtown. Before the park even opened, programs and events were already planned for the square, including hosting the performance season of the Cleveland Orchestra. A temporary outdoor installation by Milan-based Cracked Art was also commissioned by LAND Studio, the nonprofit landscape and public art agency that managed the project. The National Endowment of the Arts awarded arts organization Cuyahoga Arts and Culture a $50,000 matching grant for additional arts programming for the Public Square. 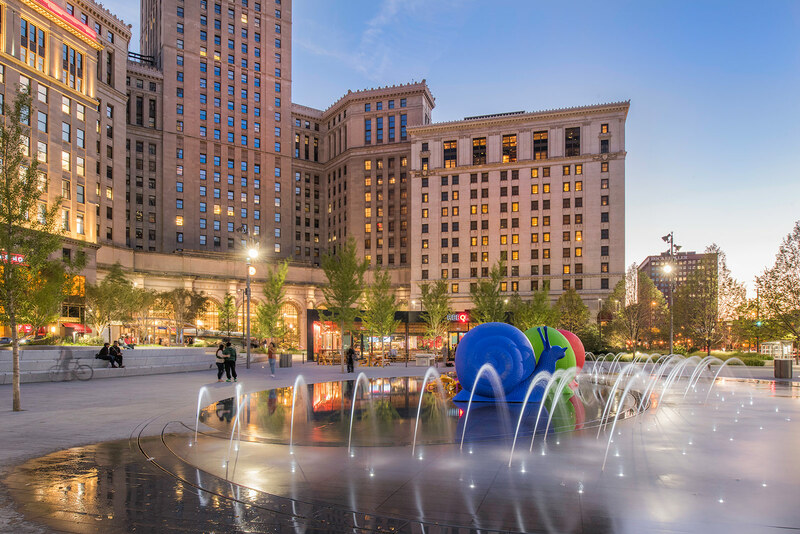 Like many recently built civic spaces across the country, the public–private partnership behind Public Square raised both the public and private funds for the needed $50 million for the project. Similar projects, such as Chicago’s Millennium Park and Houston’s Discovery Green, though both larger than the Public Square, have been wildly popular, much to the benefit of the surrounding cities. Others point to the success of JCFO’s High Line Park in New York as a good sign that the square will have the positive impact the city anticipates. In any case, Cleveland has a little more public space to enjoy—and a little less traffic to avoid—in its downtown. Creative hub A/D/O is set to open in Greenpoint with a series of events this fall and will open fully to the public in December. Developed by MINI and designed by nARCHITECTS, it will be the newest space for creative and design professionals in Brooklyn. The facility will also act as a “portfolio project” for the car manufacturing company as it explores “nonautomotive” ideas, as The New York Times reports . The multi-purpose, 23,000-square-foot space will offer 24 private desks for emerging and established designers, all of whom will have access to studio spaces and an array of design tools and resources to prototype ideas in-house. They will also work alongside URBAN-X, an accelerator for innovative hardware startups that will be headquartered at A/D/O. Classes and workshops, exhibitions of exceptional work, and a full calendar of cultural performances and events will also be hosted in the space. This programming will be geared toward building a community around design processes and solutions for improving urban life. According to Technically Brooklyn, the organization also hopes to invite non-designers into the space by including a restaurant that’s open from morning until late in the evening, outdoor and indoor hangout spaces, as well as free work areas for people who are just passing through. 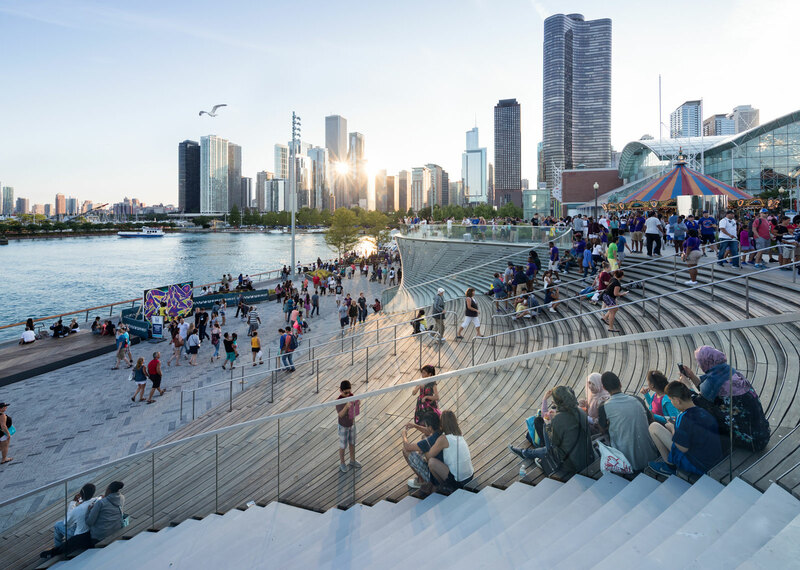 Phase 1 of the James Corner Field Operations-masterplanned Navy Pier is complete, and Iwan Baan and Sahar Coston-Hardy have captured a first look of the refurbished pleasure pier. James Corner Field Operations is also acting as lead designer on the multi-year project. James Corner Field Operations is also acting as lead designer on the multi-year project, with other collaborators including nArchitects, Gensler, Thornton Tomasetti, Fluidity Design Consultants, Buro Happold, and graphic designers Pentagram. The architecture of the kiosks, pavilions, and “Wave Wall” was designed by New York-based nARCHITECTS. Often cited as the most popular tourist destination in Chicago, Navy Pier is celebrating its 100th anniversary this year. The 3,300-foot-long pier is one of the largest of its kind in the world. Originally part of Danial Burnham’s Plan of Chicago, the pier has served many purposes over the last century, including as a campus for the University of Illinois (UIC). Before UIC’s School of Architecture moved to its current Walter Netsch-designed building, the school was located near the end of the pier. AIA Chicago’s Design Night awards ceremony, along with many other major art and design events, including EXPO Chicago, are now held in the pier multiple exhibition spaces. James Corner Field Operations’s designs include extensive renovation of the exterior public promenade of the pier. An undulating Wave Wall, inspired by Rome’s Spanish Steps, features a louvered facade that transforms into a grand stair. Near the entry to the pier a glass- and chrome-clad Info Tower acts as a beacon orienting visitors while reflecting the city and the lake. Replacing a hodgepodge of mismatched kiosks along the length of the pier, new Lake Pavilions will act as boat ticket kiosks and shaded rest areas. The polished stainless steel canopies reflect the lake’s rippling water onto the surface of the pier. Other freestanding kiosks provide for the remaining promenade guest services. Other features completed as part of Phase 1 include the new Polk Bros. Park and Fountain Plaza near the base of the pier. As the interface with the city, new traffic and pedestrian patterns were worked out to increase safety in the heavily trafficked area. The new fountain, engineered and programmed by Fluidity Design Consultants, shoots complex geometric jets of water and transforms into an ice rink in the winter. 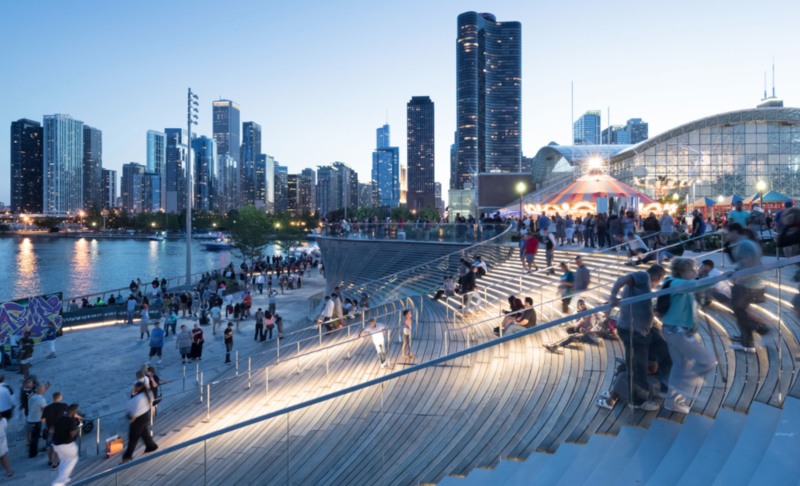 Early designs for Phase 2 of the project indicate the pier will have a new hotel designed by Chicago-based Koo Associates, and a sweeping viewing platform and pool at the pier's end. The project is also the first SITES v2 Gold-Certified project in the world, a new comprehensive international sustainability matrix managed by the U.S. Green Building Council. Are micro-apartments a revolutionary trend? Or are developers exploiting an out-of-control market? The situation was dire: People were flocking to cities for work, but scarce land and lack of new construction were driving up rent prices. Middle-income residents couldn’t afford the high-end housing stock, nor did they want to enter cramped—sometimes illegally so—apartments. Luckily, a new housing solution appeared: In exchange for small, single-occupancy units, residents could share amenities—like a restaurant-kitchen, dining area, lounge, and cleaning services—that were possible thanks to economies of scale. Sound familiar? It should: It’s the basic premise behind Carmel Place, a micro-apartment development in Manhattan’s Kips Bay that recently started leasing. The development—whose 55 units range from 260 to 360 square feet—was the result of Mayor Bloomberg’s 2012 adAPT NYC Competition to find housing solutions for the city’s shortage of one- and two-person apartments. Back then, Carmel Place needed special legal exceptions to be built, but last March the city removed the 400-square-foot minimum on individual units. While density controls mean another all-micro-apartment building is unlikely, only building codes will provide a de facto minimum unit size (somewhere in the upper 200 square foot range). What does this deregulation mean for New York City’s always-turbulent housing market? Will New Yorkers get new, sorely needed housing options or a raw deal? In a way, this deregulation is a return to an old, widespread, and subsequently outlawed, real estate formula. In New York City at the turn of the 20th century, converting hotels into apartments, and offering single-occupancy units with communal amenities, helped alleviate a housing shortage. These “apartment hotels” were wildly successful until legal changes in 1929 largely eliminated them. Now, it seems, the pendulum of history is swinging back: Carmel Place also offers shared amenities and services through a company named ollie (a wordplay on “all inclusive”). The project’s developer, Monadnock Development, has brought in ollie to facilitate weekly house cleaning, limited butler service, and more, to the building’s 25 market rate units and eight units for veterans with Section 8 vouchers. Those units will also come with space-saving furniture; the other 22 units are affordable but not serviced by ollie. While micro-apartments haven’t yet proliferated, there is a fundamental economic formula that makes them appealing for developers. It boils down to the difference between rent per square foot and chunk rent. The former is what developers use as a metric for market demand and revenue. The latter is the monthly rent the tenant pays. “Ollie is a sustainable housing model for attainably [sic] priced, high-quality housing, and we're really exploiting that understanding that the consumer is paying on a chunk rent basis and the developer is driving their model on a dollar per square foot basis,” explained Christopher Bledsoe, ollie’s cofounder. Furthermore, because rent is less a strain on residents’ finances, they become more reliable and long-term tenants. This dynamic isn’t just conjecture. Before ollie worked on Carmel Place, it renovated and leased micro units in an old Upper West Side building to demonstrate demand for smaller apartments. (The company didn’t offer its standard suite of amenities and services, so the development wasn’t branded “ollie.”) “One of the surprises is that this [micro unit] market is far broader than Millenials,” said Bledsoe. About 30 percent of the building’s renters were over age 34; they included empty nesters, retirees, those seeking to downsize or own pied-a-terres, long distance commuters, and many young couples, not all of whom were Millennials. Units in that building ranged from 178 to 375 square feet; demand was so high rent shot up to around $2,250 for the smallest units, $3,000 for the largest. “Over 40 percent of the tenants coming in [to the Upper West Side micro units] opted for a lease longer than 12 months. That's huge,” said Bledsoe. In light of this, Carmel Place is a more mature experiment in micro-living: What combination of amenities, services, and architecture can upend the long-held real estate belief that square footage determines what people will pay? This is where ollie’s pitch comes in: “For every one square foot I can eliminate from the apartment, I can give back $50 a year to the tenant in services,” said Bledsoe. Bledsoe sells ollie as essentially doing two things for renters: First, it leverages its purchasing power to provide economies of scale to its residents. 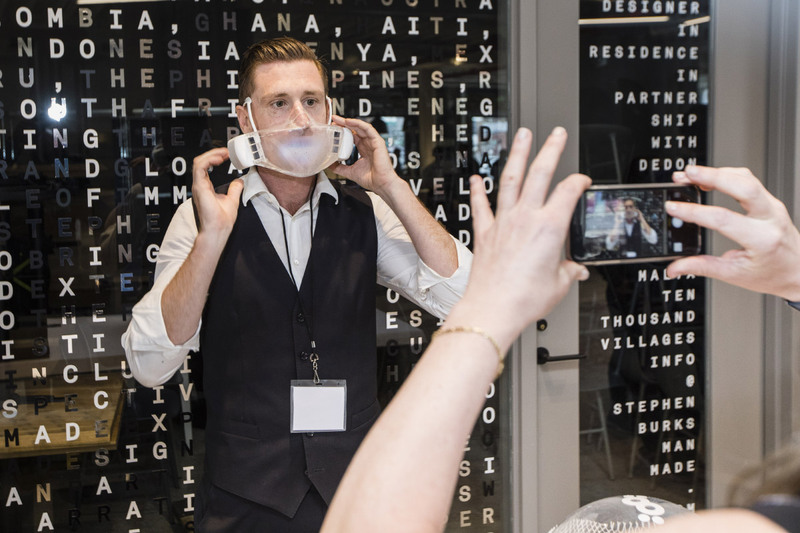 Space-savvy products from Resource Furniture, WiFi, cable, Hello Alfred butler service, housekeeping, and social club membership through Magnises, are folded into the tenant’s rent. Bledsoe argues that those expenses are frequently hidden in rents, so including them helps tenants save time and keep Carmel Place competitive with nearby comparable units. Furthermore, he added, “It's not just about services and amenities, it's about the community.” At Carmel Place, a live-in community manager helps arrange social events ranging from BBQs to lectures by guest speakers. While ollie was hired after Carmel Place was designed by New York–based nARCHITECTS, the building’s design facilitated ollie’s mission: Carmel Place features a long, open, “main street” lobby, a ground floor gym, and on the top floor, a communal kitchen, dining area, extensive terrace, and outdoor grills. The walls between the top floor’s private terraces can even be swung aside, creating one giant shared terrace. ollie’s vision for a communal, dorm-like experience also recalls WeLive, WeWork’s coliving experiment (which, unlike a true apartment, doesn’t offer leases beyond 30 days). Rent at Carmel Place isn’t cheap: At the time of writing this article, unit 6H, furnished and 265 square feet, is going for $2,720 per month. 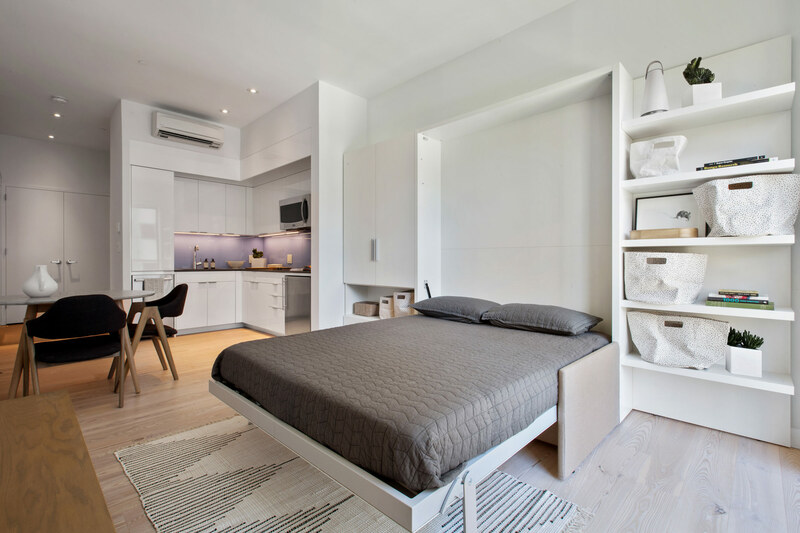 If and when less expensive micro units are built, don’t count on the same quality furniture: Carmel Place’s Resource Furniture can quickly transform a studio into a one bedroom, but it’ll dent your wallet (a standard Carmel Place Resource Furniture setup costs $13,465). If micro-apartments proliferate, isn’t there risk that some won’t be able to afford that kind of hardware? “Yeah, absolutely,” said Frank Dubinsky, vice president at Monadnock Development, who added that, “In the future what will likely happen is there needs to be more furniture out there that works in these spaces. Resource's stuff is great but it's not inexpensive.” And what about affordable housing—will the next generation of New York’s affordable units be bare, 260 square foot apartments? Thankfully, on that count, no. When it comes to the city’s new MIH (Mandatory Inclusionary Housing) program, where developers must set aside 20 percent to 30 percent of a residential building’s floor areas for affordable housing, an affordable studio can’t be less than 400 square feet and an affordable one-bedroom can’t be less than 575 square feet. Furthermore, the mix of affordable unit types (studios, one-bedrooms, etc.) must match the ratio of market rate units. Combined with density controls, it’s very unlikely a residential building would use all its floor area for micro-apartments. MIH policies are currently only in effect in the recently rezoned East New York neighborhood but, overall, the program is a major part of the de Blasio administration’s plans to build or preserve 200,000 affordable units over the next decade. There’s also the unpredictable law of supply and demand to consider. California may offer some insight: In the 1980s, in a push to increase affordable housing stock, San Diego passed a legislation to allow micro-apartments. The practice subsequently spread to L.A., San Francisco, and beyond. “To a certain extent, you have to let people vote with they wallets,” said David Baker of San Francisco–based David Baker Architects. Baker’s firm recently designed an upscale condominium development in San Francisco’s Hayes Valley; half of its 69 units are micro-apartments. “If it doesn't rent, people won't build them. If you have more competition, they'll be better and rent for less.” Monadnock and nARCHITECTS created voluminous, bright, airy interiors for Carmel Place units. “Those things are not required by the zoning code—tall ceilings and big windows—but I think they're part and parcel with this becoming a replicable typology in New York City,” said Dubinsky. Only time will tell if New Yorkers avoid less generous micro-units, a fact that isn’t heartening to those were excited to see so many innovative housing solutions—including a full-scale, Resource Furniture-equipped micro-apartment interior—at the 2013 exhibition Making Room: New Models for Housing New Yorkers at the Museum of the City of New York. Perhaps mid-tier micro-apartments will appear, along with lower cost furniture to match. Conversely, there’s the possibility that micro-apartments will remain a niche market in select cities where housing stock is short and a few urbanites will trade “space for place.” “At present, and for the foreseeable future, micro units are such a small segment of the new multi-family housing supply that's coming online in cities that it's highly unlikely they're going to have any material impact on rent,” said Stockton Williams, executive director of the Terwilliger Center for Housing at the Washington, D.C.–based Urban Land Institute (ULI). But in terms of how micro-housing is already evolving, ollie’s next two projects, one East Coast, one West Coast, may presage what form it’ll take. The first, in Long Island City, is 42 stories. Floors two through 15 will contain 426 ollie-served micro-apartments. They’ll have the same basic suite of amenities found at Carmel Place (Resource Furniture, WiFi, Hello Alfred, etc.). However, the conventional apartments can also opt into ollie’s services. The second development, in downtown Los Angeles, involves—in a twist of historical irony—a hotel. Located on a 192,000-square-foot site, the project will feature 30,000 square feet of amenities and retail. The 300 ollie micro-apartments will have access to the hotel’s amenities: “Rooftop pool, gym, lounge spaces, food and beverage, essentially what you'd expect to find in a trendy hotel amenities program,” said Bledsoe. “We're even talking about putting recording studios in the basement, doing some fun things that are more local.” Some of the micro-units will actually be micro suites (micro-units with a shared bathroom and kitchen), a model that a 2014 ULI report identified as being even more profitable for the developer. Maybe cities will find new reasons to dislike micro-apartments—when cities emptied in the 70s, their Single Room Occupancy (SRO) developments deteriorated, became stigmatized, and were vastly cut back. But this time around, there’s growing awareness among developers that communal living is marketable and desired by tenants. “For a lot of people home is the happy place, but more home doesn't equal more happy. I think more home equals more money and more maintenance,” said Bledsoe. But the exploration of micro-apartments’ future is just beginning. As Baker explained, they’re popular among seniors, not only for being cheaper, but simply “It's a lot less to clean… and they want the bathroom to be closer.” Seniors’ micro-apartments with rooftop shuffleboard? Middle-class micro-apartments paired with a Motel 6? Who knows. But if the micro-apartment does indeed take this many forms, maybe the pendulum of history won’t know which way to swing. 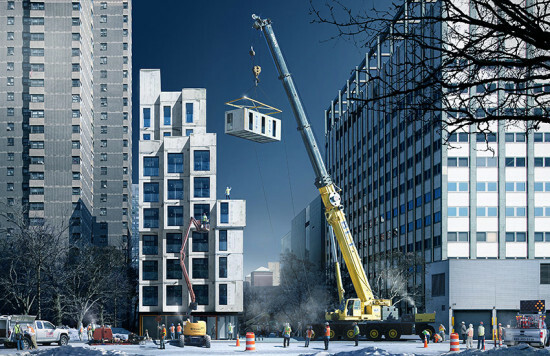 One year after nARCHITECTS won a New York City–led competition to design a micro-unit housing development, financing is in place to start construction. The Commercial Observer reports that M&T bank has secured a $10.3 million loan for the project known, which is known as “My Micro NY.” The nine-story building will rise in Kips Bay and contain 55 prefab units—each of which will measure roughly 300-square-feet. Nearly half of these units will rent at below-market rents. The paper reports, “The mini apartments will contain nearly 10-foot ceilings and seven-foot-wide balconies in addition to 16-foot-long overhead loft spaces and full closets.” The apartments are expected to come onto the market next year.